Facebook has become another cool way of spreading news and interesting things on the web. Some even term facebook as the new digg and reddit. But many users are still not aware of this link-sharing feature in Facebook and often ask how can links be shared on Facebook. In this article we will tell you 4 ways which are widely used to share and post interesting links with your friends on Facebook. The "What's on your mind" bar which you generally use for posting status updates to facebook can be used for posting Links and sharing information with your friends. Click on the link button and a new form for posting a link shows up. You have to paste the URL for the web page you want to share with your friends here and the click on attach. After successfully attaching the link, you can click on the Share button to share the link with your friends. 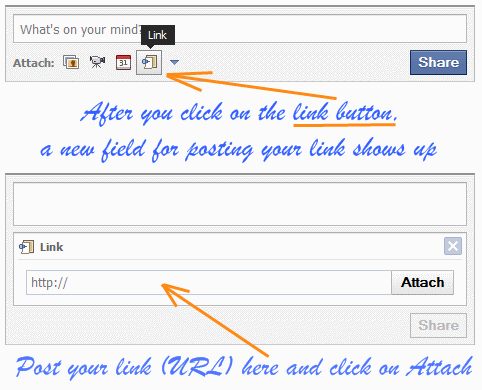 Do not forget to click on the Share Button after you attach the link. Using this method you can also share links selectively with friends by posting the link on the "Whats on your mind" bar on your friend's profile page. You can use Facebook's Share Bookmarklet to share a page with your friends on Facebook without even opening the Facebook homepage. The bookmarklet can be dragged and placed in your bookmarks. From next time whenever you like something you are reading on the web, just hit the Share on Facebook bookmark button to share it with your friends on facebook. You can use the My Links section of your Facebook profile to post links and content. Just go to the My Links section of your profile, paste the URL in the box and click on post button. Many websites and blogs use buttons on their websites which make the process of submitting the pages to Facebook. 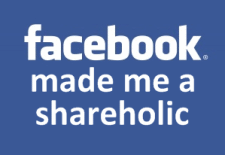 You can simply click on those buttons and share whatever you like on Facebook. Check this illustration on the right. Smart Tip: After you have added a link to be shared, you can also edit it's title before finally sharing it with your friends. Find out how.